Okoracha: Gay bishop has "defied the written word of God"
Senior Anglicans have reacted with some hostility towards the appointment by the Episcopalian church in the United States of its first openly gay bishop. In Kenya, the Bishop of Eldoret, Stephen Kewasis, denounced the decision as contrary to scripture and African culture. The Nigerian Bishop of Owerri, Cyril Okoracha, said the appointment was insensitive, and the American church had, in effect, removed itself from the Anglican Communion. "Those of us in Africa have serious difficulty with that kind of way of thinking," he said. "We are praying for him and praying for the church in the US as we are battling with our problems at this end, which includes the severe persecution we are going to receive now from our Muslim neighbours because they keep accusing us of maintaining relationship with those who deny the scripture," said Bishop Okoracha. The new Bishop, Gene Robinson, said he would do everything he could to help to heal any rift but he did not think that his appointment would make a big difference to ordinary Christians around the world. "This is a huge step for gay and lesbian folk in the church," Bishop Robinson said. Bishop Okoracha said that the elevation of an actively gay bishop affects his life, and the lives of his parishioners. He added that Gene Robinson's claim that God called him to be a bishop did not alter the fact that Bishop Robinson was defying the written word of God. 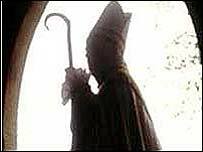 But the Archbishop of Cape Town, Njongonkulu Ndungane said the integrity of the selection process should be respected. He urged the Anglican Church to work unite and strengthen the bonds of affection that bind the Christian community together. "We have difficulties in the past and in the more recent past in relation to the ordination of women and I think that we need to hold on together and hope that we can learn to live with differences," Bishop Ndungane said. 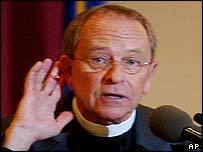 Some evangelical and conservative Anglicans have warned that the appointment of Gene Robinson as bishop of New Hampshire could split the church. The spiritual leader of Anglicans worldwide, the Archbishop of Canterbury, Dr Rowan Williams, has urged opponents of gay bishops to consider carefully before taking what he called significant and irrevocable decisions. "The Nigerian Church could form the core for an alternative Anglican communion"